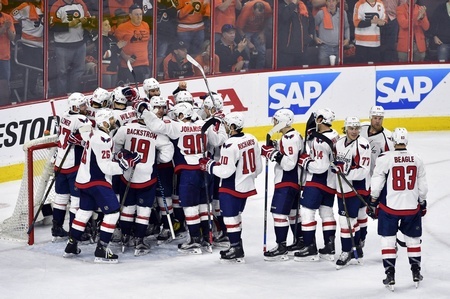 The Washington Capitals have eliminated the Philadelphia Flyers and will face the Pittsburgh Penguins in the second round. The Capitals took home the series victory with a 1-0 final score on Sunday, closing things out in Game Six. Washington netminder Braden Holtby earned the second shutout of the series with a 26-save performance. He now has a .968 save percentage and a 0.84 goals against average, making him one of the key reasons – if not the key reason – the Capitals took the eventual victory. The win was also Holtby’s 20th career post-season victory for Washington, tying him with Olaf Kolzig. If all goes well against the Penguins, he’ll tag himself as the winningest playoff goalie in Capitals history. Washington didn’t have the easiest time against the Flyers, however, and there were a few rough spots in the series. Alex Ovechkin managed five points in six games and had 29 shots on target, while Nicklas Backstrom had seven points – including the lone goal on Sunday. T.J. Oshie had just one goal over six games. And 31-year-old centre Mike Richards was held without a point across six games and his ice time dwindled around the 10-minute mark. While this numbers may seem acceptable, one has to imagine the Capitals are hoping for more explosiveness from their star players as they face the Penguins. Philadelphia certainly deserved a lot of credit for hanging around and things might’ve gone differently if Steve Mason hadn’t utterly collapsed with a goaltending performance that was frankly terrible. By the time the Flyers got Michal Neuvirth in net, the damage was done. Still, the 28-year-old posted a 2-1 record and a .981 save percentage in the series. But Mason was 0-3 with a 4.09 goals against average and a .852 save percentage. He would’ve liked several goals back and didn’t get much puck luck, allowing a dozen goals in three games. The Flyers also couldn’t take advantage of key situations. They were one for 24 on the power play in the series and couldn’t capitalize on a five-on-three in Game Six. Claude Giroux wasn’t the force he was expected to be and he managed just an assist in the series. Despite insisting that an injury was not to blame for his less-than-stellar performance, the 28-year-old from Hearst only had 10 shots on goal over six games and was often invisible. Brayden Schenn had just two assists and 11 shots, while Wayne Simmonds also had just two helpers. Shayne Gostisbehere fared better in his first playoffs, with the defenceman posting two points and outshooting Giroux with a dozen shots on target. In the end, goaltending was – as predicted – the difference in this series. While the Flyers showed their gumption and mucked it up, their efforts fell short when it came down to keeping pucks out of their own net. And they couldn’t get their big guns going against Washington. The Capitals will have to be better against the Penguins. They can’t afford as many lapses and will have to seal up their opportunities. They’ve been getting stellar goaltending from Holtby along the way, so they’ll have to hope the netminder can hold it down against one of the most offensive-gifted rosters in the NHL.